Posted By:Unknown | At:12:04 PM Be the first to comment! Oprah announced today that she is now chief executive officer and chief creative officer of the Oprah Winfrey Network, effective in fall, reports USA TODAY's Gary Levin. Peter Liguori, former Fox chief and current COO of Discovery, has been interim CEO for last few months, since Christina Norman's exit in spring. 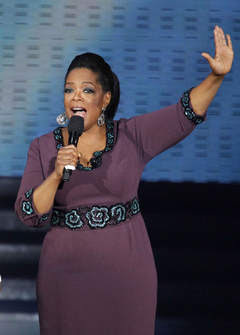 Additionally, Oprah says all future television production at her former talk show venue - Harpo Studios in Chicago - will be directed exclusively to OWN, strengthening the alignment and programming mission of both companies. Upcoming shows include Rosie, debuting in October; Oprah Presents Master Class, In the Bedroom with Dr. Laura Berman and Oprah's Next Chapter, coming in January 2012. "We are in this boat TOGETHER in a very real way now," Oprah told staffers in a memo. "I am ready to dedicate my full creative energy and focus as the full time CEO of OWN," says Oprah in the release, adding that she wants to "unleash the full potential of the network."